The beginning of the new year doesn’t just involve switching out one calendar for another. It gives us a chance to reflect on everything that transpired over the previous 365 days. That includes the ups and downs (mostly the former) of the precious metals market. Although world events, in general, remain somewhat uncertain, the precious metals market is one shining beacon of financial stability. Let’s start with some facts: 2017 went out on a high note as far as the gold market was concerned. It was up for the second year, ending at $1,309. This is 14.7% higher, or $157.00 more than it was the previous day. Silver, on the other hand, wasn’t quite as lucky. The silver market underperformed throughout 2017. It ended the year with a valuation of $17.15, which was slightly higher – 6%, or $1.16 more than before. Of course, none of this means much without a comparison between gold and the overall markets. 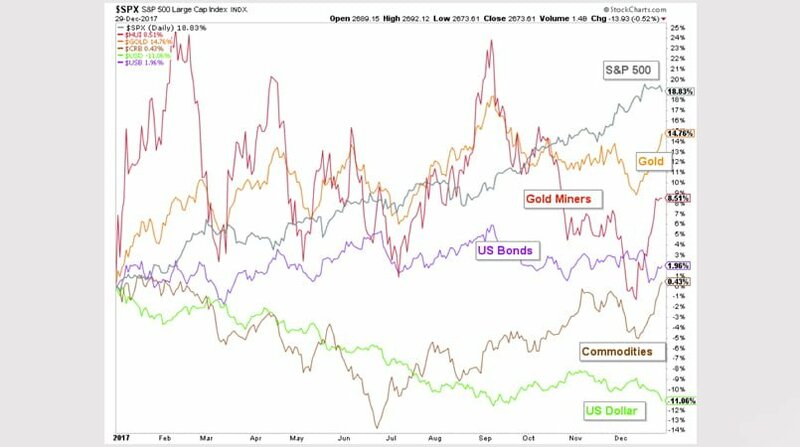 Let’s go over the valuation of gold along with some of the other major asset classes to see how they compare over the entire year of 2017. Overall, the U.S. Stock Market finished on a high note – up 18.8%. Gold wasn’t far behind, coming in second with a rise of 14.7%. Even U.S. long-term bonds ended the year with a higher value – they were up 2%. The gold mining sector itself underperformed. It only went up by 8%. This is why it’s better to invest in the metals themselves, as opposed to mining futures. Based on recent trends, physical gold tends to hold steady or go up, the same can’t be said for gold mining. The CRB index, which presents the average values of 19 actively-traded broad commodities, remained somewhat flat throughout 2017. The U.S. dollar fell. It ended the year with a disappointing 11% loss. Currently, we believe that the world stock markets are fundamentally overvalued. 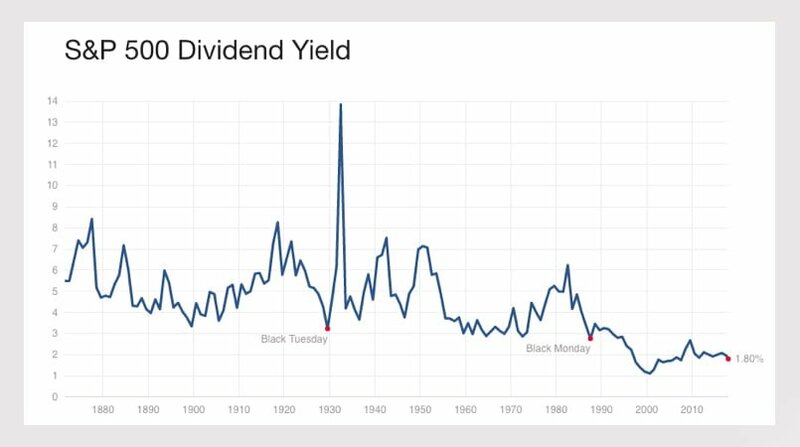 By examining the history of dividend yields from the 1800s to the present – the ones for the largest 500 U.S. based companies – it’s clear that today’s levels are nearing their peak. Since the world stock markets are overvalued, investors will be looking for steady assets to purchase. These assets include precious metals and monetary units. All of them provide a safe haven of sorts when the world stock market begins its eventual decline. Gold – Of course golds tops the list, thanks to its steady valuation. Japanese Yen – Over the last ten years – since 2007 – the Yen’s value stayed tied to gold prices. This has made a positive impact on investors who see it as a top safety asset. Swiss Franc- Up until the year 2000, the Swiss Franc was partially backed up by gold. Even after that changed, thanks in part to the fiscally conservative Swiss National Bank, the Franc has remained in the top five safe investment assets. U.S. Dollar – Even though it ended 2017 on a low, it’s still seen as a world reserve currency. Investors all over the world see it as a safety net of sorts. U.S. 30-Year Bonds – These are still seen as a very conservative and long-term investment, as they provide specific interest payments over a 30-year period. In 2017, gold outperformed all of these assets, helping it retain its top spot on the list. Christopher Aaron has been trading in the commodity and financial markets since the early 2000’s. He began his career as an intelligence analyst for the Central Intelligence Agency, where he specialized in the creation and interpretation of pattern-of-life mapping in Afghanistan and Iraq. Technical analysis shares many similarities with mapping: both are based on the observations of repeating and imbedded patterns in human nature. His strategy of blending behavioral and technical analysis has helped him and his clients to identify both long-term market cycles and short-term opportunities for profit.